Why should you use Google Adwords Pay-per-Click, Search Marketing? Google is NOT the best use of your Marketing Budget! Google dominates the UK search market with over 80% of search advertising revenues. But they should NOT have the first call on your marketing budget! Your best opportunities to get more and better value business is from your existing and past customers. Do you keep track of them? Do you keep in touch? If you still think you need to win new customers then read on. You can safely outsource your search marketing. UK Google Adwords - Your best route to new customers. Google dominates the UK search market more completely than the US or the rest of the world. Market share in January '12 was measured at 91% by Experian Hitwise. Google have not only succeeded in creating the best search engine they've also produced the best pay-per-click advertising channel. Google were first to put the most relevant adverts for every search top. 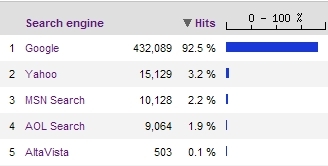 Using a quality score that includes the ads click-through-rate searchers vote the better ads up. More relevant ads have taught us all to click on the right-hand-side, the sponsored links. Google showed that many 10p clicks can pass a few £5 clicks and their $ billions have kept them on top. Google's choice of ten, four-line text, sponsored links was selected after extensive testing. Google also encouraged their clients to split-test their messages. Put up two of more messages and Google rotates them to find the winner. and was set to show the ads evenly. This was a test to prove the power of keywords in the domain name. 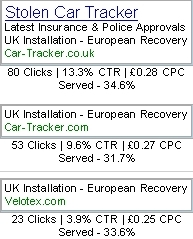 The second test measuring the difference between .co.uk and .com in the UK has under-recorded the impact by having 'UK Installation' in the text. (Google has since stopped Ad groups having Ads that land on more than one domain name. Google also deploys your changes quickly and have provided a whole raft of alerts, reports, and tools you you to track your campaign's performance. Do you use Adwords with only one Ad? Get your free Adwords Audit without obligation. Google Adwords has been used to gather market intelligence data, to test the market for new products before spending all the development budget and even to test for the best title for a book! Rob's article on Adwords as a test tool discusses this in detail. Impressions can predict demand based on natural or seasonal changes. Test market new brands and online domain names. Split test titles for books and multimedia releases. Verify interest in products and services before spending your development budget. You will need an offer, white paper or the like on your landing page. Google Analytics. The discussion about Conversion Tracking continues on the Can you Afford Adwords? page.